Set amid 300 acres of countryside in the Dedham Vale, an Area of Outstanding Natural Beauty made famous by John Constable’s paintings, Stoke by Nayland Hotel is 10 miles from historic Colchester and 16 miles from the county town of Suffolk, Ipswich. Stylish bedrooms offer free high-speed Wi-Fi and satellite TV. Many have air-conditioning and views of the Gainsborough golf course. 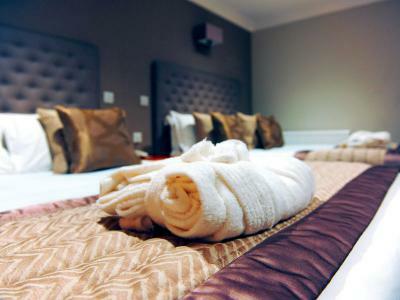 High-end self-catering lodges are also available within the hotel grounds. Uniquely, the lodges are built on a hostel site for the Women’s Land Army during the Second World War. Stoke by Nayland Hotel’s on-site Pippin Shop is a treasure trove of quality handmade gifts, food and wine. 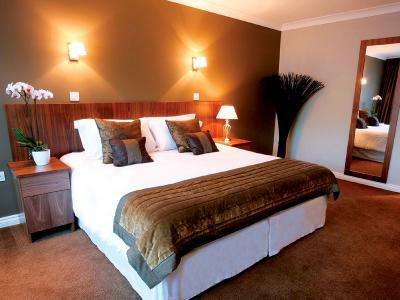 Developed from a 120-acre apple farm to a luxury resort offering Two AA Rosette-awarded fine dining in the flagship Lakes Restaurant; two championship golf courses named after famous local-born artists Thomas Gainsborough and John Constable; and the Peake Spa – featuring 11 therapy rooms, including Arabic rhassoul and Turkish hammam suites, a stunning 18-metre indoor pool, a high-tech gym and a bistro. 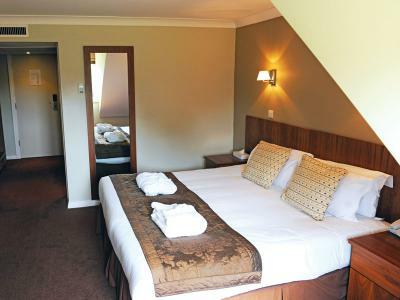 Bedrooms have been designed in a contemporary style, are spacious, well-furnished and feature en suite granite bathrooms. Thirty rooms are located in the original building, with fifty bedrooms occupying the new wing. Sitting on the edge of the Gainsborough golf course, some rooms have four poster beds and command stunning lake and golf course views. Room service is available. Contemporary style en suite bedroom offering free Wi-Fi, air-conditioning, satellite TV, digital radio, laptop safe, writing desk, direct dial telephone, alarm clock, ironing station, tea and coffee making facilities, mineral water, chocolate, bathrobes, slippers, toiletries (enhanced), hairdryer, and key card access. Contemporary style en suite bedroom offering free Wi-Fi, air-conditioning, satellite TV, digital radio, laptop safe, writing desk, direct dial telephone, alarm clock, ironing station, tea and coffee making facilities, mineral water, chocolate, bathrobes, slippers, toiletries (enhanced), hairdryer, and key card access. 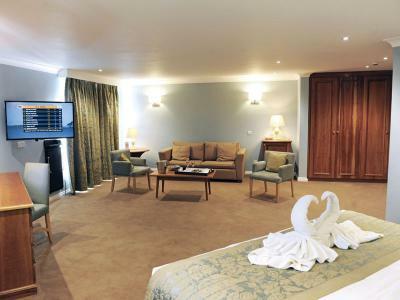 Junior suites offer plenty of space with a luxurious living room area with a sofa bed and, of course, picturesque views over the championship golf courses. Leave the M25 at Junction 28 (Brentwood) and join the A12 signposted to Colchester. Exit the A12 at the Colchester Central turn-off, picking up the A134 signposted to Sudbury. The distance from the A12 turn-off to the Hotel is approximately 8 miles. Once on the A134, go through Great Horkesley and then bypass the village Nayland following the brown signage to the Stoke by Nayland Club which takes you to Leavenheath (still on the A134). Go past the Hare and Hounds public house on the right-hand side, and continue a further 200 yards turning right on to the B1068. This is signposted Stoke by Nayland and Stoke by Nayland Golf Club. Proceed along the B1068 for approximately 1.5 miles, and the Hotel is located on the right-hand side. Join the A14 at the M1/M6 junction and travel eastwards towards Cambridge. Continue on the A14 past Newmarket to Bury St. Edmunds and exit the A14 at the third exit for Bury St. Edmunds signposted A134 Bury St. Edmunds/Sudbury. Travel south to Sudbury and remain on the A134 in the direction of Colchester. Pass through the village of Newton Green and upon reaching the village sign for Leavenheath, turn left onto the B1068 to Stoke by Nayland (also signed ‘The Stoke by Nayland Club’). After approximately 1.5 miles, the Hotel is located on the right. The Lakes confirms its place as one of the region’s best restaurants, awarded a second AA Rosette for its delicious cuisine. Offering a masterfully crafted à la carte menu, fresh, seasonal ingredients are used to prepare mouth-watering modern British dishes. Meat and vegetables are sourced from local Suffolk farms; plus, in keeping with the family farming business, berries and asparagus are picked from just next door! True to its name, guests can dine in stylish surrounds – smoked oak and shades of chocolate – whilst taking in magnificent panoramic views over the floodlit lake and 18th greens. Adjoining the restaurant, the hotel lounge bar offers a relaxed atmosphere for a pre-dinner drink. The Gallery is Stoke by Nayland's new, contemporary first floor restaurant serving up Mediterranean-style meals drenched in 270-degree views of softly rolling Suffolk. This is Constable Country after all. A year-round open-air feel complements the signature gyros, a Greek dish made up of the head chef’s hand-picked meat of the day served wrapped in a deliciously light khobez flatbread. Stunning 270-degree panoramic views over the lake, 1st tee and both 18th tees and greens define your dining experience at the glass-fronted Clubhouse Restaurant. Enjoy traditional hot meals from an open kitchen, served all day and cooked fresh to order, or watch live sports in the Gallery Bar. Situated within the spa, Peake Bistro offers an informal ambience, where spa guests can relax and chat, overlooking the pool, whilst enjoying a freshly prepared meal, snack or beverage. Serving a delicious light lunch, this bijou restaurant provides a perfect complement to your holistic spa journey. In the summer, dining at Stoke by Nayland reveals an altogether different flavour. Take a seat in the fresh open air – sunny or shade – and dine al fresco. The Lakes Restaurant opens out onto the south terrace, where, as always, the view is spectacular. Or, sitting on the south-facing terraces of the clubhouse, enjoy a meal whilst watching your fellow golfers (try to!) tame the course. Don’t miss the opportunity to indulge in afternoon tea whilst staying in this glorious setting – savour homemade scones with fruit preserve and cream, sandwiches, cakes and a pot of tea. Both traditional afternoon tea and champagne afternoon tea are available to order and can be enjoyed in the hotel lounge – sitting comfortably by the roaring open fire, burning sweet-smelling apple wood from the family farm – or on the terrace, overlooking the lake and golf courses. Afternoon tea can be booked in advance, at a special price, when booking your room via ClassicBritishHotels.com. The unique surroundings of Stoke by Nayland present a wonderful setting for private dinners and celebrations. The hotel caters for reunions, anniversaries, family gatherings, birthday parties, charity and club events, and business dinners. Choose from a range of private rooms, each with its own individual character. Call Classic British Hotels on 0844 967 0984 for advice and let us help you organise a memorable private dinner. An Aladdin’s cave of exquisite ‘pick your own’ hampers and boxes, hand-made gifts, jewellery and toys, and food and wine. In season, Pippin also sells taste bud-tantalising fruits which are still grown on the family farm surrounding the hotel – apples, strawberries, raspberries and blueberries. For guests staying in one of the hotel’s self-catering, luxury country lodges, Pippin offers quality, choice and convenience. Set amidst 300 acres of glorious ‘Constable Country,’ on the edge of the Dedham Vale, Peake Spa and Fitness offers guests an enviable retreat from the world, where they can unwind and indulge at their own pace, or take full advantage of the state-of-the-art Technogym. Set in the picturesque Suffolk countryside, with lakes, streams and mature woodland, Stoke by Nayland Golf Club enjoys an international reputation for its championship courses and first rate golfing facilities. Its profile has been further raised by the recent worldwide television coverage of its PGA European Senior Tour events. Gainsborough’s 10th tee has been voted one of the most outstanding holes in East Anglia by the PGA. The 18th hole is played across water - one of four large lakes - to a green nestling in hillside in front of the stunning glass-fronted clubhouse. Spectacular wooded fairways and natural water hazards characterise this picturesque course, whose final hole, like the Gainsborough, requires a exacting drive over a large lake to a plateau green where the adjacent clubhouse awaits. Gainsborough’s House, in the heart of the market town of Sudbury, is the birthplace museum of Thomas Gainsborough, one of the greatest artists in the history of British art; with a large, permanent collection that spans his entire career. There is also a delightful walled garden. Perhaps the best preserved medieval village in the UK, famous for its wool cloth trade in the 16th Century, Lavenham’s Church and Guildhall are of particular note. Stunning listed, timbered-framed cottages line the village streets, a vestige of its golden era of affluence. The largest Norman Keep in Britain, Colchester Castle reopened on the 2nd of May, 2014, after a major redevelopment – a new, state-of-the-art museum featuring an interactive hub, full-size burial reconstruction, audio and visual character stories and video projections. Once a wasteland of gravel soil and boggy hollows, today these world-famous gardens are celebrated for their harmony of colour, foliage and texture; from the emerald grass and lily-pad ponds of the water garden, to the spring flowers and autumn colours of the woodland garden. Stoke by Nayland offers a purpose-built conference and events venue, with nine flexible meeting spaces, all fully air-conditioned and featuring private terraces with inspiring views – ideal for pre-dinner drinks and canapés. The Devora Suite caters for up to 400 delegates, allows for vehicle access, and features a full length balcony to the south and a private terrace to the west, with stunning lake and 18th green views. There is free Wi-Fi throughout the hotel and free parking on-site.